An imine-functionalized mesoporous solid base catalyst (BA@BE-PMO) was prepared by template agent-directed self-assembly condensation of bis[3-(triethoxysilyl)propyl]amine and 1,2-bis(triethoxysilyl)ethane in acid solution. The imine groups with catalytic activity were integrally embedded into mesopore walls of as-made BA@BE-PMO. In Knoevenagel reactions in aqueous medium, the BA@BE-PMO catalyst exhibited better catalytic activity than imine-functionalized SBA-15 catalyst synthesized using the traditional co-condensation method, which can be attributed to the pore surface with strong hydrophobicity originating from –CH2CH2– group fragments incorporated into pore walls. The strong hydrophobicity of the surface facilitates adsorption and diffusion of organic compounds on the catalyst surface in reactions in aqueous medium. 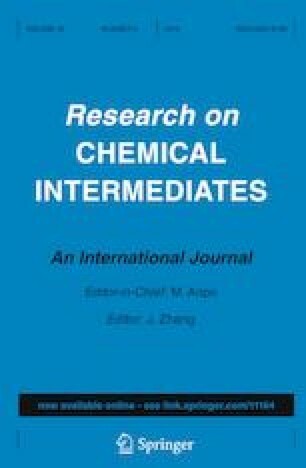 Moreover, it exhibited comparable catalytic activity to dipropylamine homogeneous base catalyst because of the uniform dispersion of imine group active sites. The BA@BE-PMO catalyst could also be recovered and reused in up to five runs without significant loss in activity without any negative environmental impact. This work was supported by the National Natural Science Foundation of China (51872109, 21677099, 21876112), Natural Science Foundation of Jiangsu Provincial Department of Education (17KJA150002, 15KJA150003), and College Students’ Practical Innovation Project of Jiangsu Province (201810323009Z).